There are a long list of reasons why someone might want to visit Europe. Perhaps they want to explore the hustling, bustling streets of a major European capital like London or Paris, maybe they want to get in touch with nature in Germany’s Black Forest or the Swiss Alps, perhaps they wish to appreciate and admire castles and historical sites that have been standing for hundreds of years, or maybe they want to enjoy some unique cuisine and culture that cannot be found anywhere else in the world. Another huge reason to visit Europe is to simply get away from civilization and spend some relaxing rest time down on the beaches, and if you want to see the best beaches on the continent, the Mediterranean Sea is the place to be. The Mediterranean, which is connected to several major European countries including Italy, France, and Spain, is well known for its warm waters and astonishing scenery. If you're looking to experience the sights and sounds of the best beaches in the Mediterranean Sea, Sicily is one of the best places to visit. It's the biggest island in the Mediterranean, boasting over 600 miles of coastline in total. Situated just off the southwestern shores of Italy, Sicily is home to some of the Mediterranean's most visually stunning landscapes and natural landmarks, including the world-famous Mount Etna, Europe's tallest volcano. It's a paradisiacal island with a rich culture and a lot to offer, including some of the best beaches in Europe. If you’re planning a visit to Sicily and want to make the most of your trip, you can’t risk missing out on the island’s best beaches. The wonderful thing about the beaches of Sicily is that they have so much variety; whether you’re looking for a lively beach with a lot of activities or a secluded, romantic spot for an evening stroll or a lazy sunbathing session, you’ll find all you need on this incredible island. Read on to learn all about the best beaches of Sicily. If you're staying in Palermo or visiting this beautiful Sicilian city on your tour of the island, be sure to stop off at Mondello. It's only a 10-minute drive from Palermo and is one of the most popular gathering spots for the locals. On weekends and special occasions, this beach fills right up with lively chatter of Sicilians and tanned tourists. One of the main symbols of the beach is the breathtaking art deco Antico Stabilimento Balneare bathhouse, with its colorful, castle-like design attracting plenty of photographers. You'll find some good quality restaurants here too. 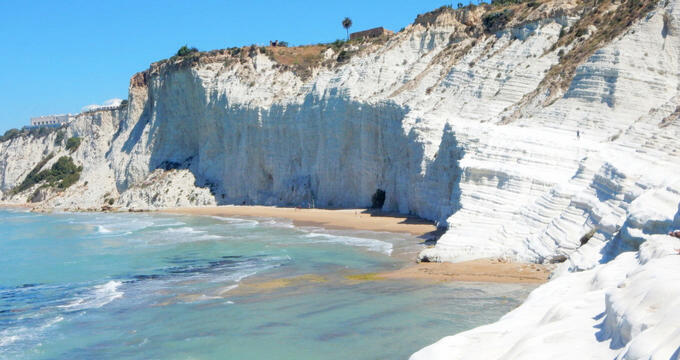 Undoubtedly one of the best-looking beaches not just in Sicily, but in the entire Mediterranean, Scala dei Turch is quite close to the city of Agrigento and immediately stands out due to the white cliffs located all around it. It's one of Sicily's must-visit spots and will definitely appeal to those with adventurous spirits who like to climb and explore. The chalk-white cliffs can be a great spot to do some climbing, offering stunning views to those brave enough to reach the top. There are some good diving spots to be found as well and the beach runs a long way, providing a lot of space for games, picnics, and more. One of Sicily's most beautiful beaches, Cefalù is made up a long crescent moon-shaped stretch of golden sand. Offering stunning views of the local architecture and towering cliffs, this is a really pretty beach and a perfect place for people of all ages to come and sunbathe while admiring the scenery. Due to the crescent shape of the beach, the waters here, especially in the center of the beach, are very calm and gentle, presenting idyllic swimming conditions for people of all ages. What's more, lots of good amenities can be found in the local town including stores and eateries, so you can spend a full day on this beach without ever needing to worry about getting hungry or running out of things to do. Many Sicily tourists tend to congregate on the island's most popular beaches like Scala dei Turchi and Cefalù, but if you're looking to flee the crowds and enjoy some relaxation and reflection in peaceful surroundings, Torre Salsa is the place to be. Not far from Agrigento and Selinunte, Torre Salsa is an often-overlooked beach with a lot to offer. The golden sands here are simply gorgeous and the local white cliffs can rival those seen at Scala dei Turchi, without coming with the inconvenience of crowds and noisy tourists. It's a little tricky to get down to this beach and the route involves hiking along a bumpy dirt trail, but it's definitely worth the effort and is conveniently located near a wildlife reserve, with guided eco tours available in the area for animal and nature lovers. Down on the southern coast of Sicily, not far from Agrigento, Licata is a real favorite with both tourists and locals. There's actually a lot of fascinating history to this beach, with the Allies landing here during the Second World War, but you'd never know that it was once a military location with its soft white sands and stunning panoramic views. Swimming and sunbathing are very popular here and various useful amenities can be found along the beach including equipment rentals, seafood restaurants, accommodation, and restrooms.